The Elgar Petersen Arena set up for a vigil on April 8. Deep down, you knew you hadn’t shed your final tears over the Humboldt Broncos. 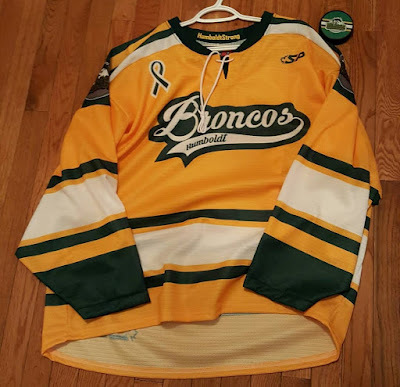 A little over five months after a bus collision on April 6 claimed the lives of 16 players and team personnel, the Broncos returned to the ice Wednesday to host the Saskatchewan Junior Hockey League’s regular season opening game against the Nipawin Hawks, who are the circuit’s defending champions. With the clash at the Elgar Petersen Arena broadcast nationally on TSN, it was a certainty the water works would come from anyone in any part of the world watching that game. In a really well-played junior A clash, the Broncos, who are under the guidance of new head coach and general manager Nathan Oystrick, scored first with a power-play goal coming from the stick of centre Michael Clarke at the 2:08 mark of the second period. Inside of the final 5:30 of the second, the Hawks received singles from Cole Beamin and Jeremy Bisson to go up 2-1. That score held up as the final outcome despite a Broncos golden last chance in the dying seconds of the third coming off the stick of Clarke following an offensive zone faceoff. Hawks star goalie Declan Hobbs made the stop, which was one of his 39 saves on the night. Broncos standout netminder Dane Dow played valiantly on the other end making 24 saves. For the community of Humboldt, everyone affected by the tragedy and the community at large all over the world whose hearts sank on April 6, Wednesday’s game was a big step forward in the healing process. That healing process still has an uncharted ways to go, but a new normal for the community of Humboldt just got a lot closer. When the Broncos and Hawks collide again in Nipawin on Friday, the Broncos players and coaches will be living a day-to-day life that more resembles the regular rigours of a hockey season. Regular routines will start to form again as the 2018-19 campaign progresses. Humboldt Broncos jerseys became a common sight all over Saskatchewan. Between the April 6 crash and Wednesday’s game, most of the focus revolved around the daily news on how the families of the players and staff were dealing with the aftermath of the crash. The bus carrying the Broncos to play a Saskatchewan Junior Hockey League playoff game in Nipawin was involved in a collision with a semi-truck just north of Tisdale resulting in 16 deaths and 13 injuries on the bus. The world rallied to support the Humboldt players and staffers including a GoFundMe campaign that raised over $15.1-million with donations coming from over 141,900 individuals and entities in just under two weeks. It is crazy to think Humboldt residents Sylvie Kellington and Caitlin Hergott originally had the small goal of raising funds to cover parking costs for the families visiting hospitals with the GoFundMe campaign. Their efforts became the largest GoFundMe campaign ever in Canada and the third largest ever in the world. Wednesday’s contest provided another chance to heal and pay tribute to the 2017-18 Broncos, and that was done in spectacular fashion in front of an over capacity crowd of 1,998. Brayden Camrud and Derek Patter were the two survivors of the crash that returned to the team this season, and they took part in the opening faceoff. The ceremonial puck drop was performed by a large group of their teammates from a season ago who also survived the crash. Both Camrud and Patter played outstanding with Camrud recording an assist on Clarke’s power-play goal. While the game on the ice wasn’t the biggest focus on the night, it provided a great compliment to the rest of the festivities. Following the game, an emotional ceremony that lasted about 45 minutes was held to cap off the night. During the ceremony, 29 banners, one for every person on the Broncos bus, were unveiled and placed in a circle around centre ice. All the numbers worn by the Broncos players who were on the bus on April 6 were retired. Camrud and Patter will wear their numbers for the rest of the campaign, before those digits officially get taken out of circulation by the Broncos. 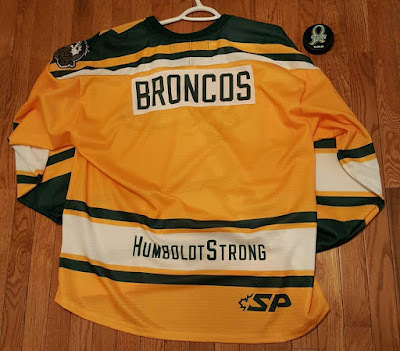 A back of a Humboldt Broncos jersey made to support those in the bus crash. On social media, people from all walks of life made uplifting comments on Twitter about what they saw from Wednesday’s game. Of course, no one will be able to bring back the players who dies in the bus crash in captain Logan Schatz, Adam Herold, Conner Lukan, Evan Thomas, Jacob Leicht, Jaxon Joseph, Logan Boulet, Logan Hunter, Stephen Wack or Parker Tobin. The same goes for head coach and general manager Darcy Haugen, assistant coach Mark Cross, play-by-play voice Tyler Bieber, stats expert Brody Hinz, athletic therapist Dayna Brons and bus driver Glen Doerksen. The crash survivors in Camrud, Patter, Graysen Cameron, Kaleb Dahlgren, Bryce Fiske, Xavier LaBelle, Matthieu Gomercic, Nick Shumlanski, Tyler Smith, Ryan Straschnitzki, Jacob Wassermann, Layne Matechuk and Morgan Gobeil will soldier on. Matechuk and Gobeil are still in hospital. As a collective, those 29 have shown the world it is possible to come together to heal and care and that everyone can be #HumboldtStrong.